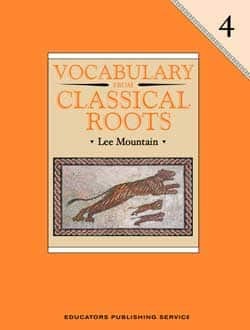 Each lesson has two roots and 8-15 words. 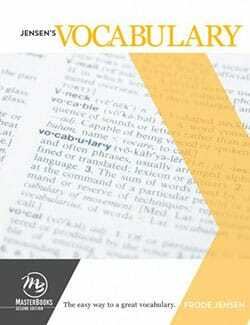 Exercises include synonyms, antonyms, analogies, and sentence completion. The “Nota Bene” sections explore word histories and etymologies. Expository and creative writing are integrated into every lesson. 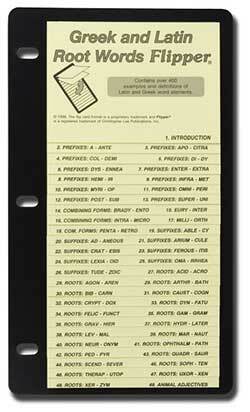 Teacher’s guides provide lesson-by-lesson support. There are sixteen lessons in each level. Reviews are scheduled after every two lessons in levels A to E.
Tests are available separately. Each of the eight tests covers two lessons. 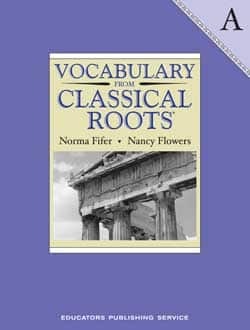 According to the publisher’s website, Vocabulary From Classical Roots is aligned to the Common Core State Standards. Tests for practice with standardized test questions for one student. For one student, it is non-reproducible. Reproducible tests for practice with standardized test questions. There is a test for every two lessons in the book for a total of eight tests. Tests for practice with standardized test questions for one student. 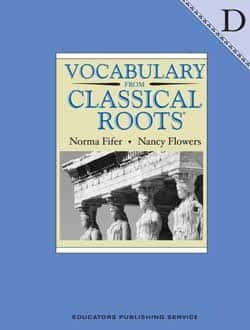 The Greek and Latin Root Words Flipper covers terms and formulas for Greek and Latin root words. 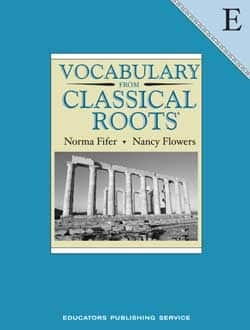 It is a useful supplement to any study of Greek and Latin root words. 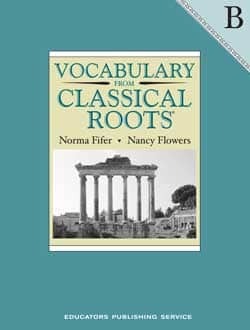 Vocabulary from Classical Roots® is a registered trademark of EPS School Specialty.